Your dog’s favorite home away from home. Deciding where to leave your dog while away on vacation is an important decision for loving pet parents. There are so many things to consider about dog boarding: will my dog be safe, be well taken care of, and happy? There are plenty of options to make sure your dog is cared for while you’re away. Some people consider having a dog sitter come to their home, or a dog walker coming three or four times a day to feed and walk their furry friend. 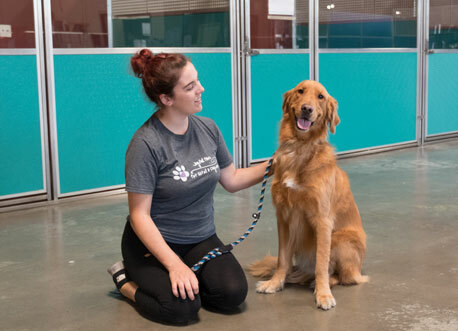 There is a better choice for dogs that thrive on canine and human companionship: dog boarding at a quality pet care facility like Joyful Paws Hotel in Long Beach, CA! We also offer a variety of Extra Amenities for a hotel quality stay. New Customer - Free First Night! Discount subject to availability and cannot be combined with any other offers. Boarding discount applies to first time customers only and is valid for any lodging accommodation selected. Call for info! Dog Boarding in a safe, friendly, and stimulating environment is a great solution for your dog. Why? 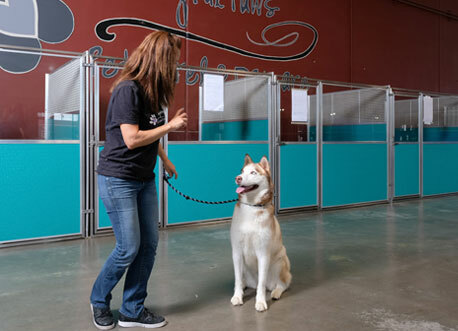 Quality dog boarding facilities are built just for dogs. 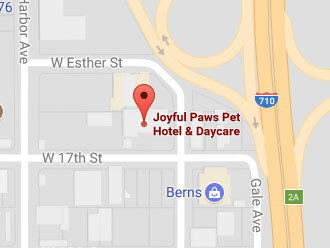 We provide a safe, secure, and loving home away from home for pets here at Joyful Paws Hotel in Long Beach. 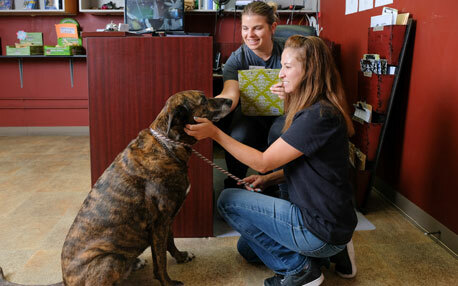 It’s also filled with many pet loving professionals who are reliable and trustworthy. This way instead of being home alone missing you, your canine companion can spend his days surrounded by doggy and human friends. And thanks to the expertise and care of our staff, all dogs that stay with us are offered plenty of comfy places to rest and snuggle up in, the choice to eat their own dog food, plenty of potty breaks, and attention. Joyful Paws provides a safe, nurturing, and exciting dog boarding environment for well socialized and behaved doggy guests. Gone are the days when dogs were simply left in the kennel. Joyful Paws Hotel is a happy place for dogs and provides both open-space boarding or the luxury of a private suite. We include a day of play for each day a dog stays with us. So at Joyful Paws, every guest is safe, secure, and having a blast. We're convenient to the entire greater Long Beach area including Lakewood and San Pedro. Dogs love coming to Joyful Paws for their overnight stay! There are lots of amenities for dogs to enjoy, and play time is included at no extra charge. We have soft rubber flooring and synthetic grass in our play areas. Guests are welcome to bring bedding and toys from home however, Joyful Paws is also happy to provide these items free of charge. Dinner and breakfast are served in the private suites at 7 am and 5 pm, and our doggy guests remain in their suite for one hour after they eat to digest their food properly. You can relax and enjoy your vacation knowing your pooch is being well taken care of. Your fluffy friends will be monitored and cared for by our staff, fed their regular food, and enjoy all the comforts of home while enjoying a little vacation of their own! Quality Dog Boarding, including play, starts as low as $59.95 per night. Copypright © 2017 Joyful Paws Hotel. All Rights Reserved.